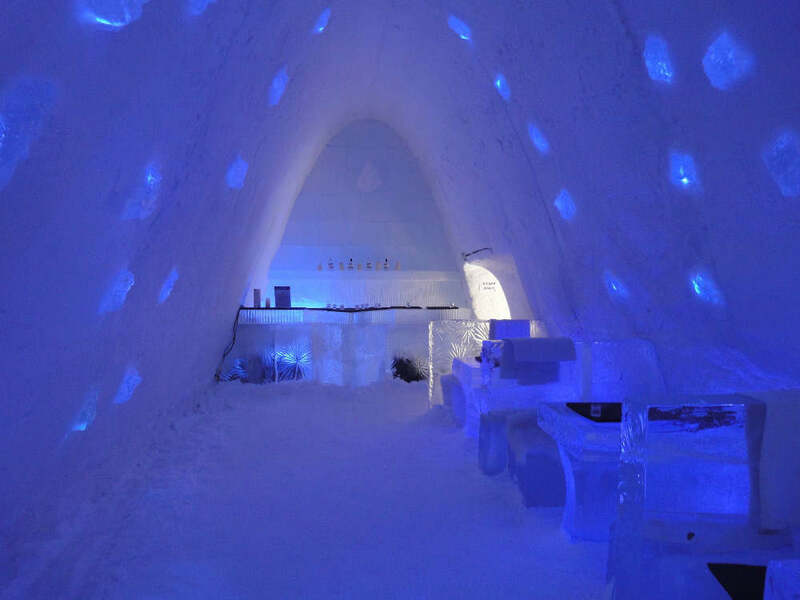 On this 6-days (7 days with travel) tour you will stay six nights far away from the closest villages to have best chances to see Northern lights. 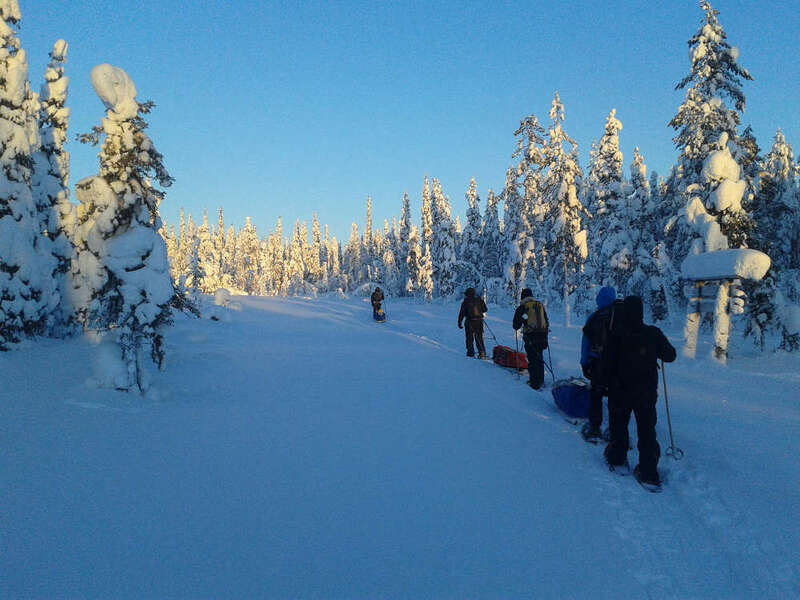 You will explore the pristine Arctic nature of the Pallas-Ylläs national park on a three days' snow-shoe safari. 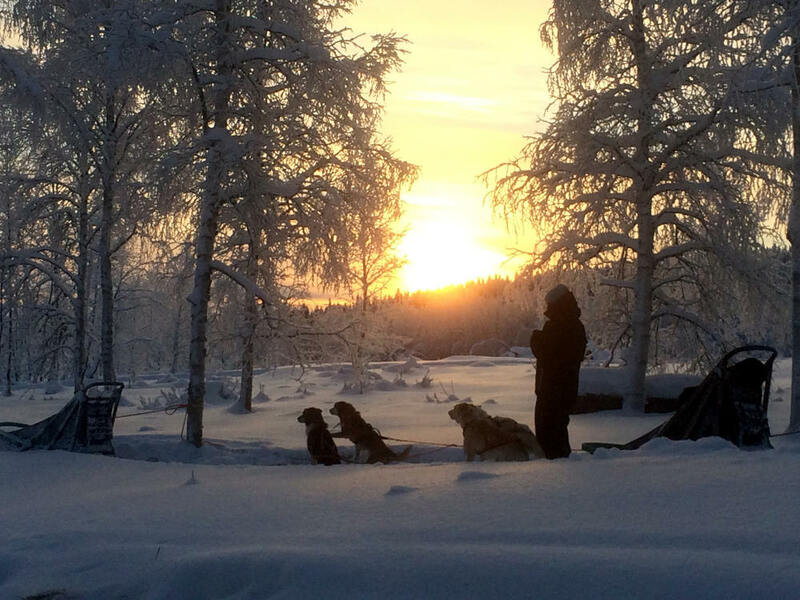 On the following two days you will venture to the nearby wilderness on traditional forest skis and on sledges pulled by huskies. With at most six people in the group, we ensure a private and exclusive atmosphere. The tour takes place in the area of Levi-Muonio, one of the best areas to see the Aurora borealis. This tour is accessible to anyone who enjoys outdoors and occasional trekking. Day 1: (Sunday) Pick-up from the Kittilä airport. 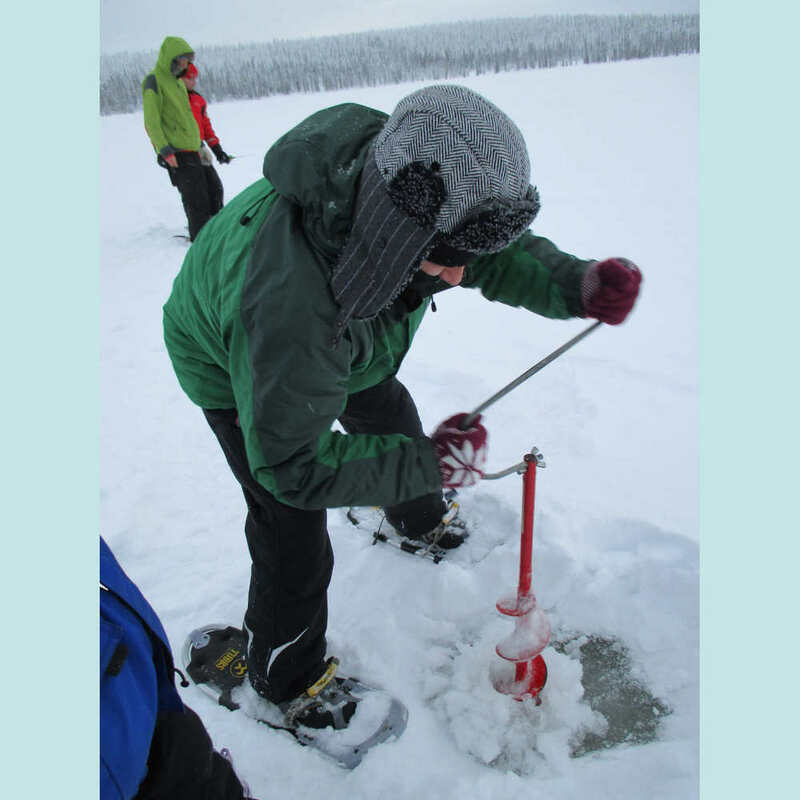 Info session on the week's tour and short trek to test snow-shoes. Sauna. 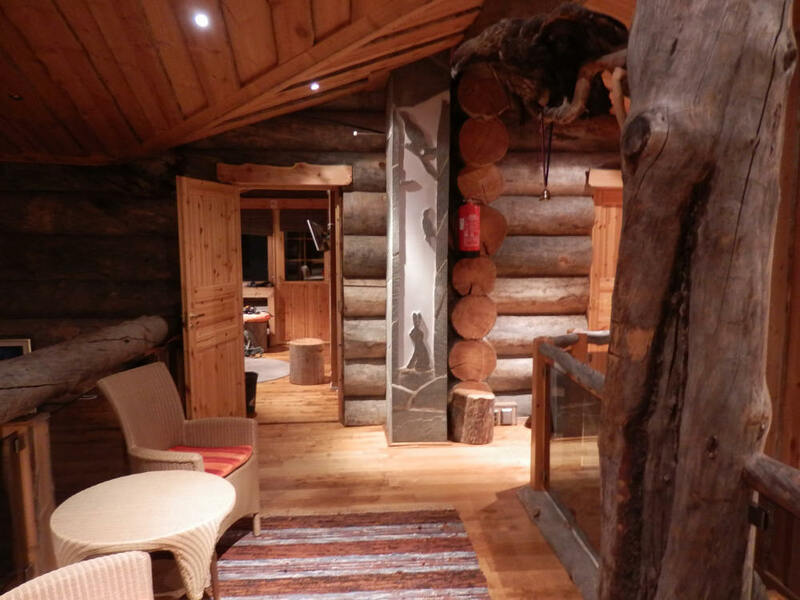 Night in a fully equipped chalet. Time to hunt for Northern lights. Day 2: First day of snow-shoe safari. Trek to the cottage which will serve as our base for three days. Lunch on open fire. Dusk trek towards tree-line of the surrounding hills. Dinner, sauna and night in a wilderness cottage. Time to hunt for Northern lights. Day 3: Day-trek to the treeless tops of the surrounding fells and through mythical-looking forests. Views over an endless wilderness. 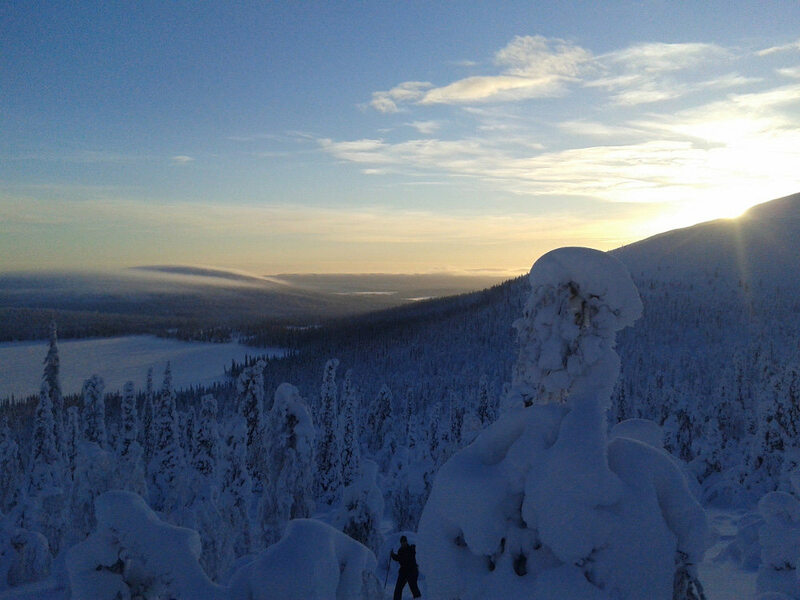 Stories of Lapland, its nature and people. Lunch on an open fire. Possibility to sleep outdoors under a tree. Dinner, sauna and night in a wilderness cottage. Time to hunt for Northern lights. Day 4: Relaxing at the wilderness cottage, ice fishing on the frozen lake, possibility to test cross-country skiing in powder snow (with forest skis). Trek back from the National park. Traditional smoke sauna, dinner. Night in a fully equipped chalet. Time to hunt for Northern lights. Day 5: Relaxed day around your chalet. 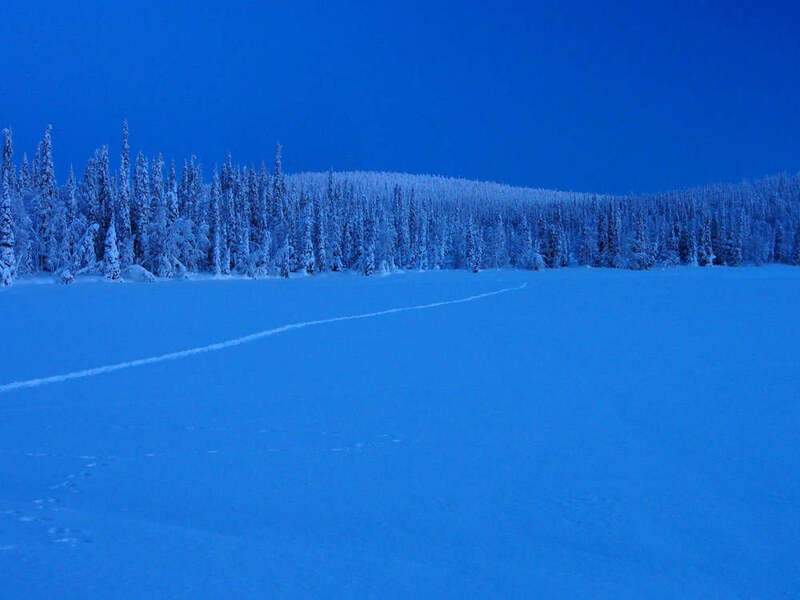 Possibility to explore the surrounding forests on snow-shoes. In the afternoon a guided tour on traditional forest skis - or cross-country skis with which you can ski in deep powder snow. Dinner, sauna. Time to hunt for Northern lights. 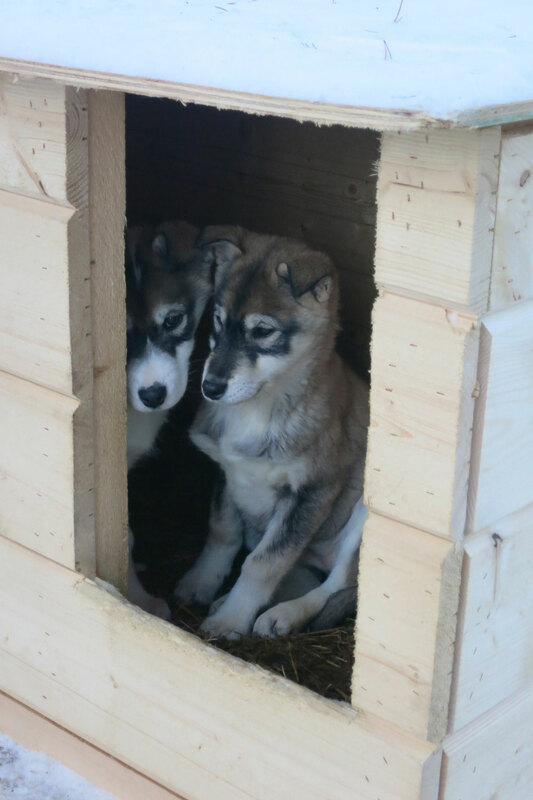 Day 6: Husky safari day. 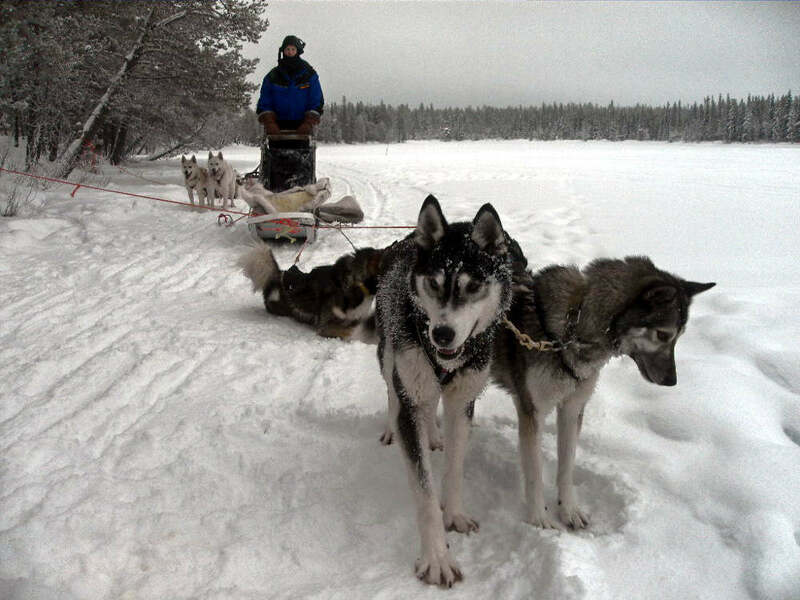 Getting to know your team of dogs after which everyone drives his own sledge pulled by huskies. Feeding the huskies upon arrival. Transfer back to the fully equipped chalet outside of the village of Levi. Time to hunt for Northern lights. 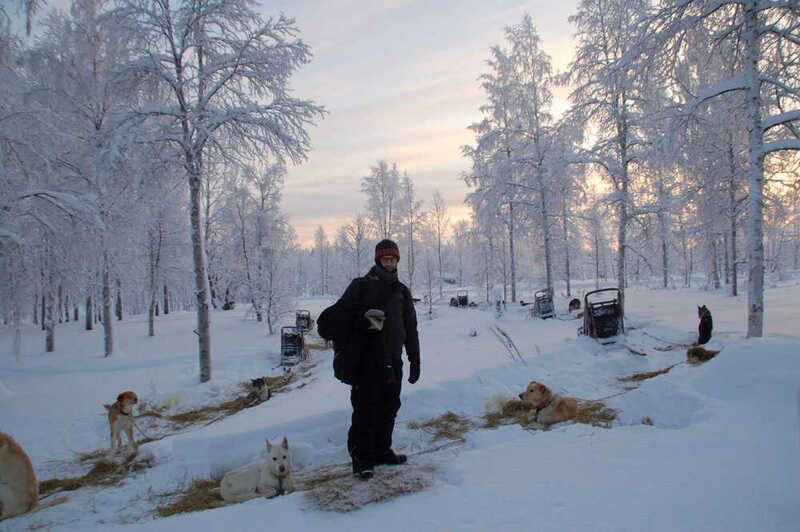 Day 7: (Saturday) Visit of a reindeer farm in the morning and a reindeer sledge ride. Possibility for own activities such as visit of exhibition on the Saami people. Transfer back to the Kittilä airport. In winter 2019 this tour is available on some weeks for private groups of 4-6 people. There are no spots for individual travellers. 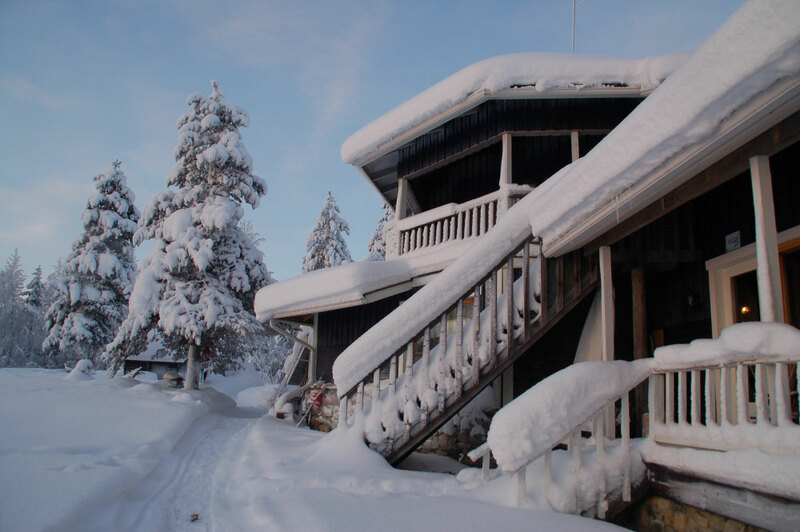 Accommodation: Four nights in authentic style and fully equipped chalet. Two nights in a cosy wilderness cottage. 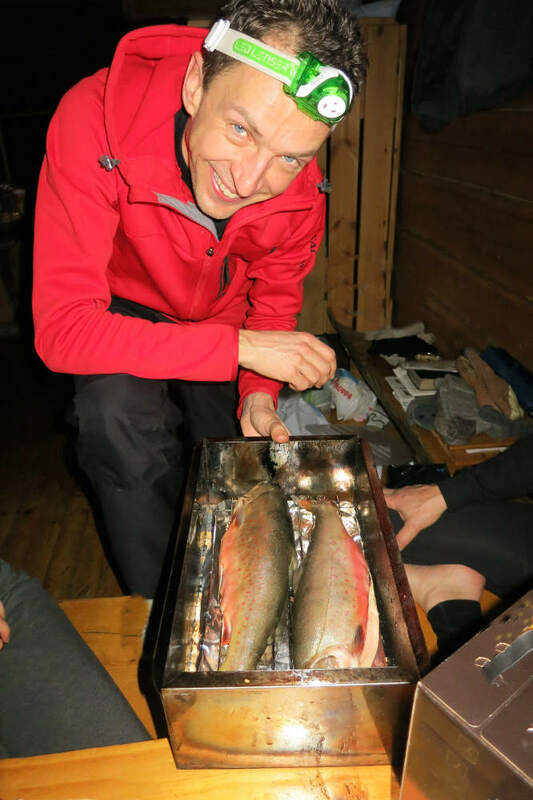 Food: We will serve delicious traditional dishes from Lapland. 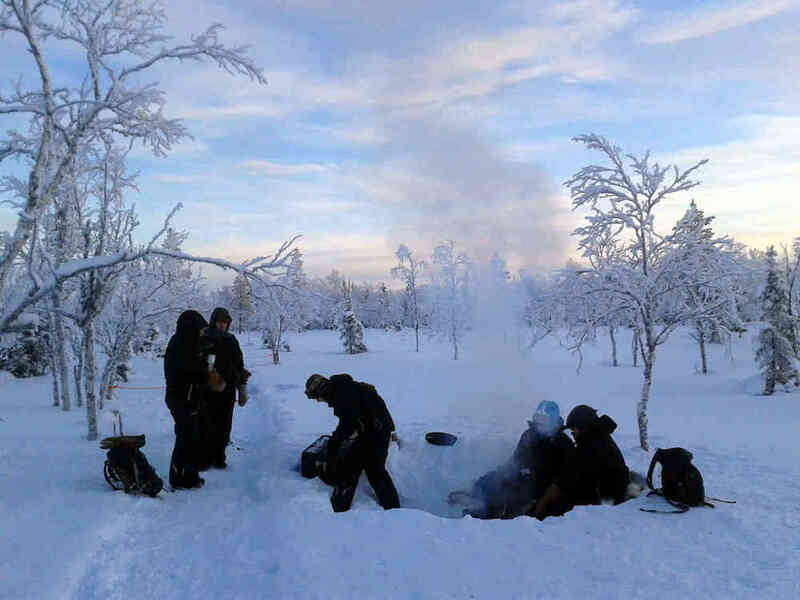 The highlight of the week is the smoked fish which we will smoke ourselves outdoors, on an open fire. Video about the Silence and Nature tour. 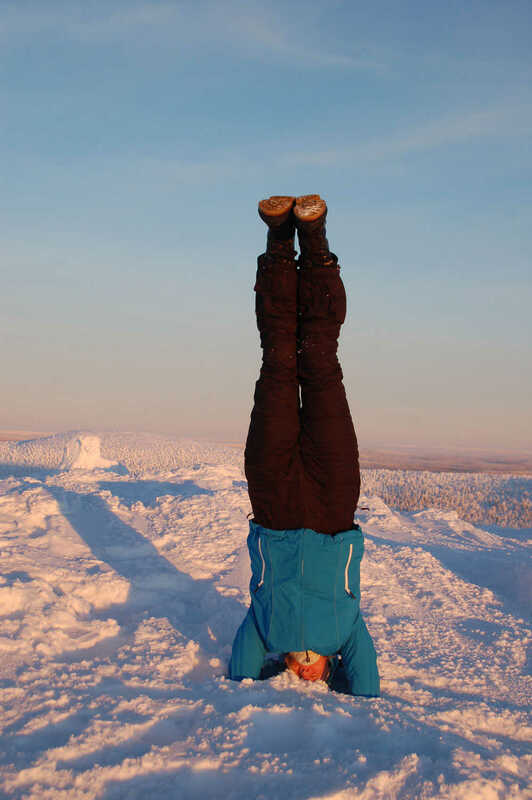 Have a break and inhale fresh Arctic air! Price per person is higher if you have a group of fewer than 6 people. Price does not include: flights from home country to Kittilä, dinner on Friday, travel insurance. Tour description and price subject to change without prior notice. You can book this tour also for a private group of 2-6 people. The cost per person depends on number of participants and the programme. 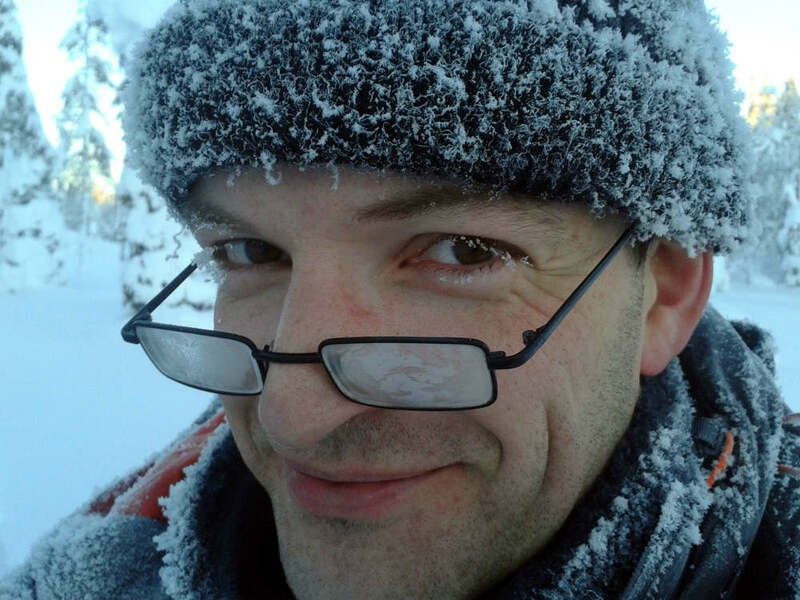 Cross-country skiing in powder snow with "forest skis"